R-tic American Eskimos - American Eskimo Dogs - Naples, FL. Cairo was 2001 "Best Of Breed" winner at the prestigious Westminster Kennel Club show. Cairo was owner handled and showed himself to perfection. Thank you judge Miss Virginia L. Lyne. Cairo was also awarded an " AWARD OF MERIT" at the 1998 Westminster Kennel Club. 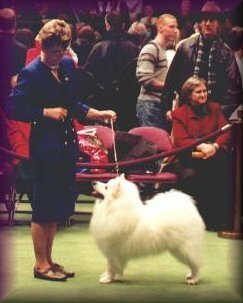 R-tic American Eskimos is a home breeder of top quality "STANDARD" American Eskimo Dogs. Our goal is to produce quality show dogs and companions with stable, happy temperaments. All pups guaranteed for health and temperament. We provide lovingly bred, home raised pups to qualified homes. All companion puppies are sold with a spay/neuter contract. We provide a lifetime home for any puppies sold. Please take a few minutes to visit. I hope you enjoy the gang. We would love to hear from you. Stop back again soon.